Saturday morning, I woke up with motivation to unpack and re-organize my half of the office. Jason also woke up with a mission in mind, a mission to conquer the food booths at the MN State Fair. We hopped in the Jeep, and drove to the state fair grounds, where we drove in a 10 mile or so circle looking for a parking spot. Finally, we gave in and paid (gulp) $20 to park about a block away. Never did I think we’d be paying that much to park! 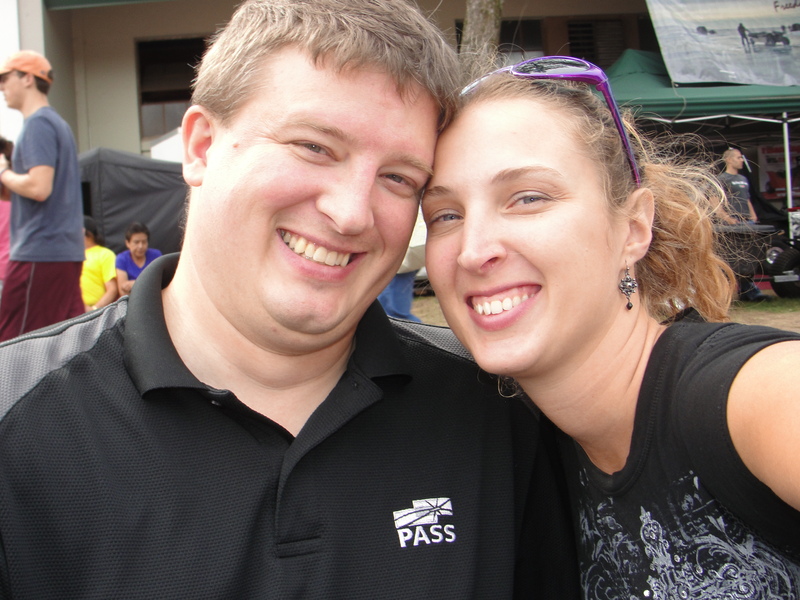 We walked into the fair and checked out all the things we can’t do when we have the kids with us. We walked in the Eco Building (where I picked up some info on making my own compost bin). Then, we went to the art building, where we got to see Jason’s friend Charlie’s painting on display. We also checked out the Education Building, which was MUCH different than I remember it being the last time I was in there. It felt more like a political building. After walking and people-watching for a while, we decided to start on conquering our list of fair foods to eat. We ate lots of different things. We shared all of it so that we could eat more variety. We ate a foot long hot dog with onions (which cured my craving for a Chicago Dog from Sonic), a pork chop on a stick (one of my favorite fair foods), a “giant juicy turkey sandwich” (which maid Jason say “good” when I was too full to eat much – more for him), a stuffed pepper (never had one before, I liked it), a corn dog, cheese curds, lemonade, ice cold Coke, and my other favorite – Sweet Martha’s Cookies. What we didn’t get that we normally would included roasted corn on the cob, mini donuts, funnel cake, french fries, soft pretzel (not for me – ew – but Jason and the kids like them), and all you can drink milk (I SO wish I could still enjoy this booth – doesn’t agree with me anymore, even though I love milk). A little bit of heaven - NOT on a stick! 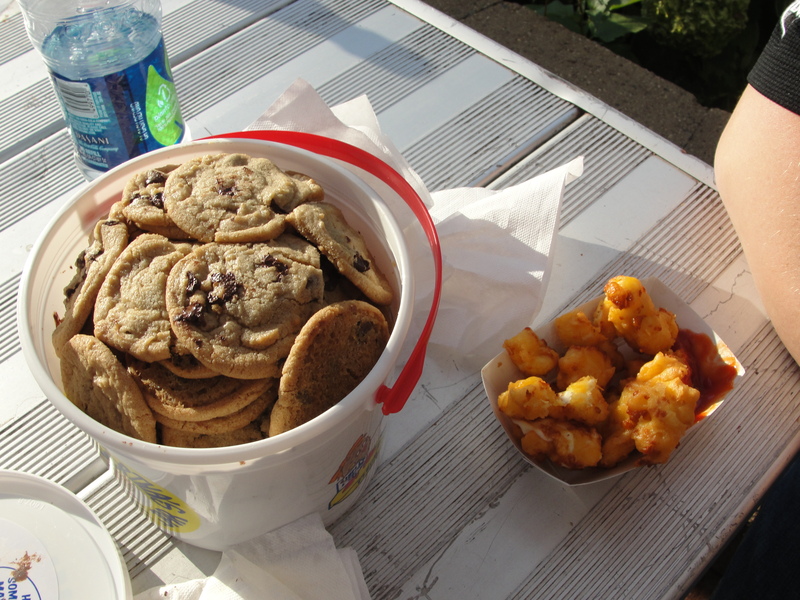 A word on Sweet Martha’s Cookies, and The Mouth Trap Cheese Curds: Not only do these two items represent some of my favorite foods at the fair, they have super efficient systems to move the herds of people through very quickly. At the cookie building, there were about 100 high school kids working there (or, at least seemed that way). Several of them were just bringing the trays of fresh baked cookies to each of the scoopers. The scoopers had all the buckets hanging above their heads, and someone kept them stocked… The line was incredible, but they moved us through in just minutes. At the cheese curd booth (in the food building), it’s $5 for a tray of cheese curds. You give one person the money, they hand you a ticket, you move down the counter, and they had cheese curds fresh and hot, waiting for you… again, super long line, moved us through in minutes. Way to go!!! We also went into the birthing barn where a pig was having difficulty giving birth to her babies. Six babies had been born, and they thought there were probably 6 more to come. We waited about a half an hour, with her looking as though she’d get another one out, but it wasn’t quite happening. 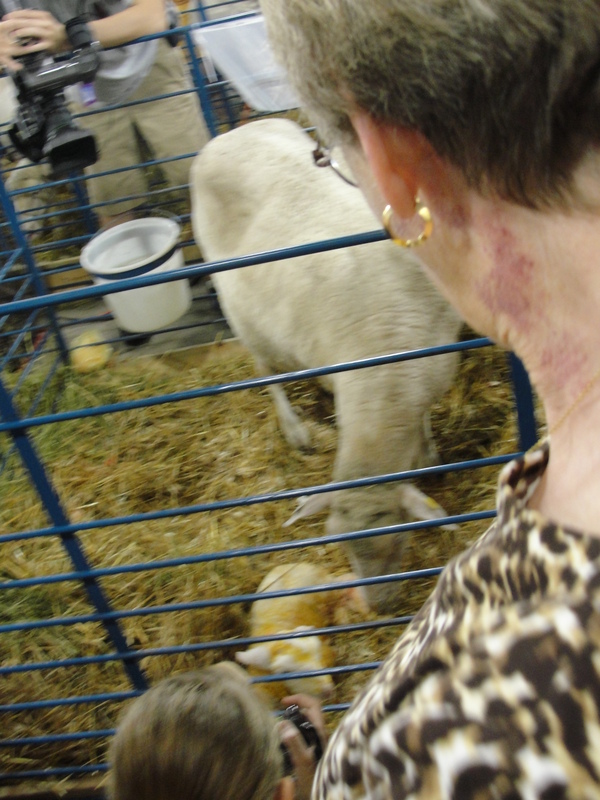 They said she was nervous about being a first time mom and all the people around… A lamb had just been born moments before we got in there too. We saw the Mama cleaning up her baby (or, maybe she was eating it, according to Jason). We also got to go into both the coliseum and the bottom of the auditorium, where all the booths of things for sale are. We had just run out of some yummy garlic seasoning that Jason had bought at the fair before. We HAD to get more of that! We also got some info on a water softener (I hate the way our water smells in the shower and laundry), and found some awesome storage racks that hang from the ceiling in the garage. Jason and I had just been talking about building something like, not 2 days before! It will be cheaper for us to buy them and install them, than to go to Menards, buy all the materials, and then take the time to make the shelves ourselves. That was a win! If the kids were with us, there’s no way we could have even gone into the building! Overall, it was a good day! !